The keeping of Tarantulas is becoming more and more popular. They are noiseless, often docile and none time consuming pets. A pet Tarantula requires very little space, they are also easy to feed and care for. Unlike other smaller pets they are long lived, with some of the more popular species living 10 – 15 years. Tarantulas make a good alternative to traditional pets are a suitable for under 18’s as long as parents supervise during feeding and maintenance. Unlike Reptiles and Fish very little specialist equipment is needed to house a tarantula. Just an enclosure, furnishing and a heat source. They are noiseless creatures that do not smell. – Low Maintenance! As little as once a week feed and water. They take up little space; majority of adult Tarantulas should need an enclosure bigger than 30 x 20 x 15cm. They are long lived and fascinating creatures. Tarantulas are predators and you will need to feed living animals to your spider. If you think this might pose a problem, please reconsider your decision to keep arachnids. Tarantulas can’t be handled and stroked like Traditional Pets. Tarantulas keepers rarely end up keeping just one, expect to end up having a room full of spiders. It’s an addictive hobby! Before you purchase your first Tarantula research how to care for them and make sure you understand it fully before buying. It is recommended that you buy a good book and read the care articles on this site. Next stage is to research the species you would like to own to make sure it is suitable. We always have a selection of ideal beginner’s species available so there’s no hurry to order. Make sure you are fully committed to looking after your new pet. Also make sure members of your household would happy with this new addition. We always recommend first time keepers start with a Spider that is juvenile (approx 8cm) too adult size. Spiderlings are best avoided as these have a lot more margin for error and will require small pot sized enclosures. Spiderlings of majority of the popular pet species tend to be slow growers and will take a few years to grow before they start looking like a Tarantula. Most of the popular pet species can usually be supplied in Juvenile and Sub adult sizes (SA). These are usually around half adult size and still have years of growing left. It is also best to start with a Terrestrial species, rather than arboreal. Generally the calmest and most docile spiders that make the best pets are found in Chile, Argentina, Paraguay, Mexico and the USA. Anything from anywhere else especially Africa or Asia should be avoided as these will be defensive pet species. One of the most popular pet species as it is docile, slow moving and will not flick hair or bite. This Chilean species can tolerate a wide range of temperatures and conditions. They are easily available at a reasonable price. Similar species to look out for is the Northern Gold (G.sp.”North”), Chile Pink Zebra (G.sp.”Concepion”) and Red Chile Rose (Grammostola rosea). These are all of a similar nature and size; just vary in colour a lot. This is an impressive large, bulky jet back species and it is very desirable for many hobbyists. It is as docile as a spider can be making an ideal species for the novice though due to the popularity it can be hard to obtain. Similar species also worth looking into are the Brazilian Red Rump (G.acteon) and the Brazilian Tawny Red (G.iheringi). This is another gentle giant. Not only do they reach massive sizes they are docile and reluctant to flick hair. They have attractive gold stripes running down there legs. Juveniles are often available though adult specimens are hard to come by. 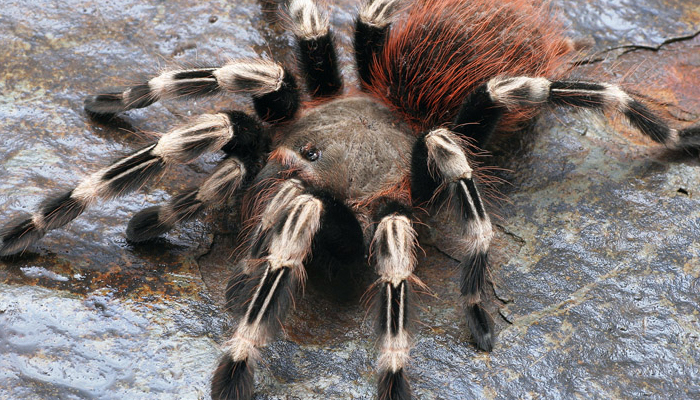 This is the classic pet Tarantula species that have attractive red and black patterning. It is long lived, large and robust. This species spends a lot of time out in the open and makes a good display species. However unlike the above species it can be prone to flicking hair if provoked. Juveniles of this species are available often and adults are also occasionally available. Other similar species that make a good alternative are the Mexican Red Leg (B.emilia) and Mexican Flame Knee (B.auratum). This species grows to a respectable size and has a docile nature. It is a fluffy black Tarantula covered in long brown hairs. It is commonly available and usually at a reasonable price. This species grows to a respectable size and has a relatively docile nature. It is a bulky gold coloured Tarantula with black femurs. It is often available and usually at a reasonable price. Other similar species that make a good alternative are the Desert Blonde (A.chalcodes), the smaller Mexican Blood Leg (A.bicoloratum) and the very attractive Costa Rican Zebra (A.seemani). This is a mid sized species that is has a gold carapace (body) and legs with long red hairs on the abdomen. Not only are they attractive but also docile. They are occasionally available at a reasonable price. Other similar species to look into are the Chile Pink Burst (P.scrofa) and the Chile Beautiful (E.truculentus).